Our house is in a quiet residential neighborhood called Miramar. We rent from the government, which is customary; you aren’t allowed to buy or rent property from individuals. We love the people and the culture here, despite the challenges of living in a Communist country. We hope to stay for a few more years, and I recently started a store selling items handmade by local artisans. 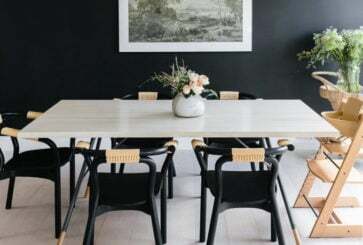 On setting up a household: We’re lucky to live in a wonderful old house with great bones, but it had been untouched for decades, like most houses here. We needed to repair the plumbing, fix the floors and paint to make it habitable. In the U.S., the updates we did could have been wrapped up in a couple of quick projects, but here, it’s more complex. Basics like white paint aren’t always stocked in hardware stores and you have to get creative. The other day I needed a few screws, but three different hardware stores were completely out of them. I noticed some packages of hinges, which I didn’t need, that came with screws. Problem solved. On living with less: The average monthly salary is $20 to $30 — almost everyone earns less than $50 per month — and budgets are tight despite many free or subsidized services like food, education, healthcare and utilities. There is an expression here, “resolvemos,” which translates roughly to, “we’ll figure it out.” It’s a national mantra, used in every household to describe overcoming challenges. People will say, “I resolved eggs today,” meaning they were able to find eggs. You learn to make do and you realize you need less than you think. On diapers: In so many other countries you can go online and, voilà, the next day you’ll have a box of diapers at your doorstep. In Cuba, diapers are hard to find, poor quality and too expensive for the average Cuban at about a dollar each. So, it’s common to see disposable diapers hanging on clothes lines. Mothers reuse them by taking out the stuffing, washing the outside cover and refilling them with cotton. People who visit sometimes ask me why people don’t use cloth diapers, but modern cloth diapers aren’t sold here and would be too expensive on the black market. Also, washing machines are rare. 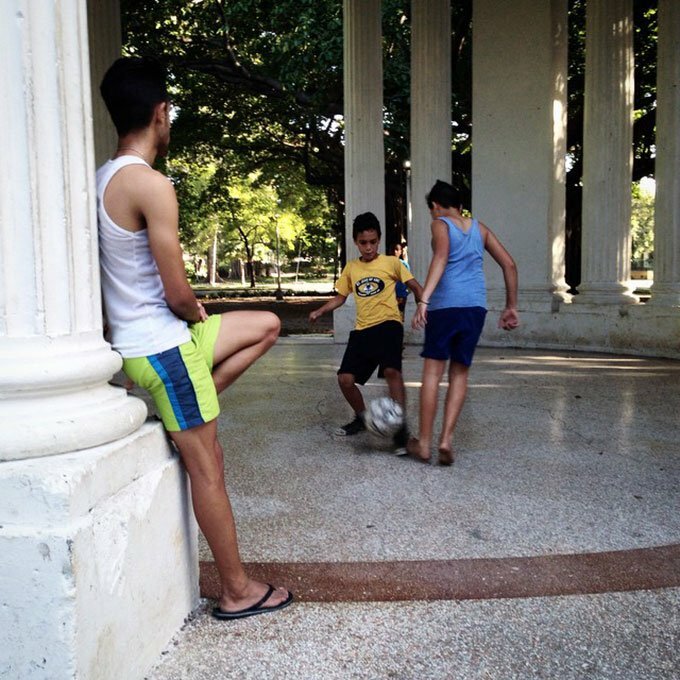 On island life: Havana is a tropical city and we’re lucky to have beach weather almost all year; much of life happens outdoors. You can see or smell the ocean wherever you go. The city is surrounded by a long seawall and promenade called El Malecón. This the heart and soul of Havana. During the day, people fish, do calisthenics and throw Santería offerings into the ocean. (Santería, meaning “the worship of saints,” is a traditional Afro-Cuba religion.) We love to take a walk there at night, when large crowds of people gather to enjoy the sunset and the breeze. Everything pulses with life — lots of young Cubans sharing bottles of rum, making out, playing music or just escaping from the heat. On the Cuban temperament: This is a wonderfully friendly place. People you meet for the first time and friends alike are always greeted with a kiss, and it’s totally normal for a stranger to engage you in conversation on the street. 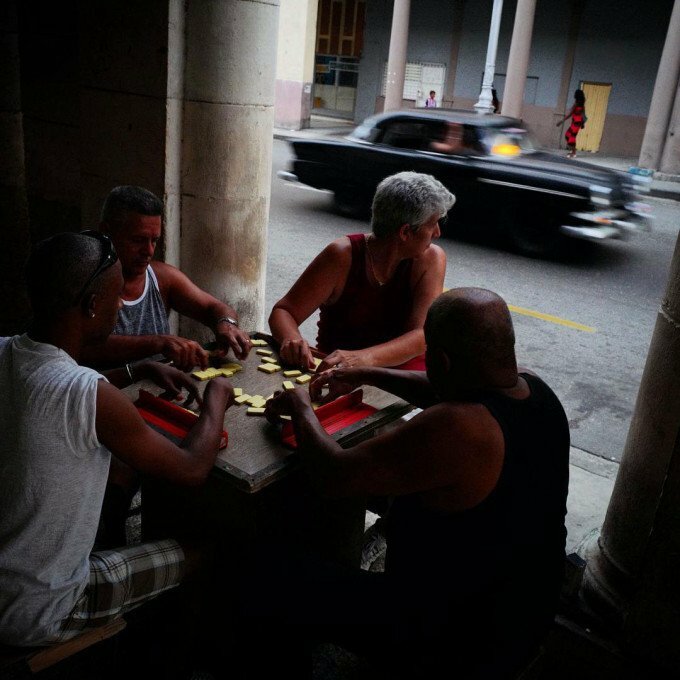 People delight in the opportunity to chat about music or current events, and maybe one of the reasons is that the Cuban population overall is highly educated — the government has made education free and mandatory — but because of the difficult economic situation, it is not uncommon to find a doctor or engineer driving a taxi, where they have more access to valuable tourist dollars. Funnily enough, I’ve found that it can be difficult for Cubans to admit they don’t know something. I’m always extra careful when asking for directions on the street. I’ll usually confirm at least twice, because oftentimes someone will give me wrong directions to avoid saying they don’t know! Similarly, Cubans you meet will talk readily about politics and life in Cuba, but many of them don’t immediately feel comfortable telling you how they really feel. People often hold back a little until you become better friends. On Cuban-American politics: Cuba’s relationship with the U.S. is complex. For decades, the Cuban government has blamed many of its economic problems on U.S. policies, like the trade embargo. But, at the same time, Cubans passionately follow American sports and music, and almost every Cuban I know has family that lives in the U.S. So, our experience has been that Cubans show genuine warmth to Americans. Anytime I find myself in a long line, which is common, people will start up a conversation, often beginning with a knowing sigh and the phrase “¡no es facil!” or “it’s not easy!” In the end, American or Cuban, there is a certain solidarity in that we are all in this together. 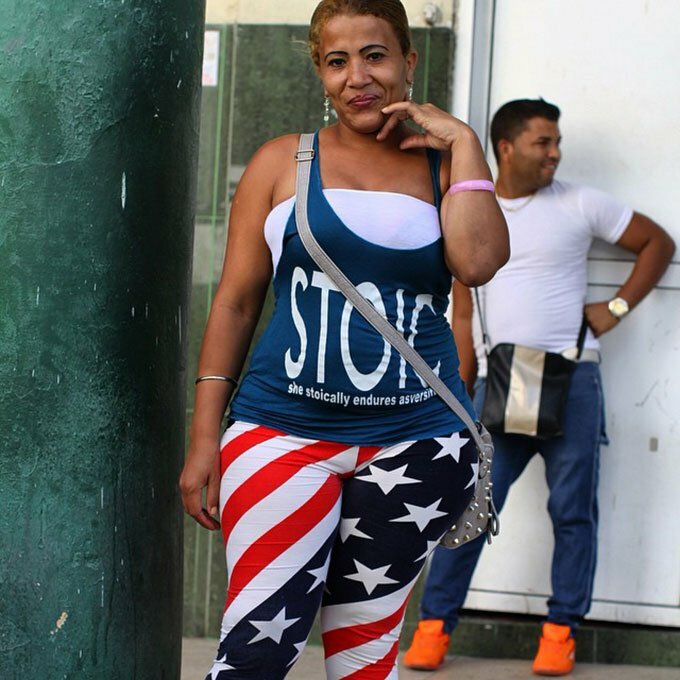 On fashion: Cuban fashion is a spectacular hodgepodge of government-supplied clothes, black-market items brought in from other Latin American countries and hand-me-downs. Many people get their style sense from American movies and music videos shown on state TV. So, it’s not uncommon to see an everyday outfit that’s reminiscent of a Lady Gaga or Beyoncé stage costume. Also, Cubans often wear clothes that are a couple of sizes too small, in part because it’s difficult to buy new clothes, but also it’s just the style. Even traffic police wear uniforms that are two sizes too small! On medical care: The healthcare system here is amazing for such a poor country. There’s a network of walk-in clinics where you can be seen for anything from a minor cut to a heart attack at no cost. 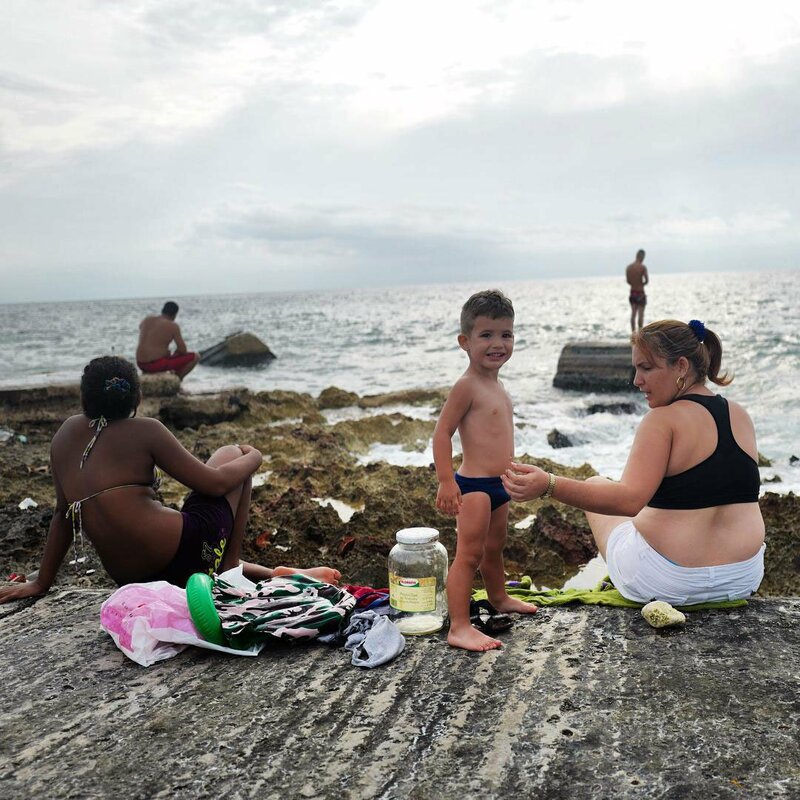 Because of the wide availability of medical care, Cubans are so comfortable with doctors and medicine that people will freely talk about intimate medical information with anyone. But, while people outside the country might see the Cuban healthcare system as ideal, it doesn’t always feel that way if you are used to American healthcare, with so much more technology, consent and choice. In my experience, the hospitals sometimes lack basic equipment or materials. If you need to give a urine sample, for example, you’re told to boil a jar at home. The first time a friend heard this, she asked me, “Should I use a pickle jar or an olive jar?! ?” Once, when my son Nicolas had an asthma attack, I brought him to the hospital and they didn’t have a mask available to deliver his inhalation medicine. Instead, they improvised by putting a simple glass tube in his mouth. On the rarity of children: For decades, Cuba has had an extremely low birth rate compared to most other countries. This is a complicated issue involving many social and economic factors, but the result is that children are idolized. Strangers touch our kids’ hands, offer to carry them or say, “Que Dios lo bendiga” meaning, “God bless them” when passing by. Our Cuban friends have sometimes told us we need to ward off evil spirits by pinning traditional amulets called azabaches, made of pieces of jet and gold, to our kids’ clothes. 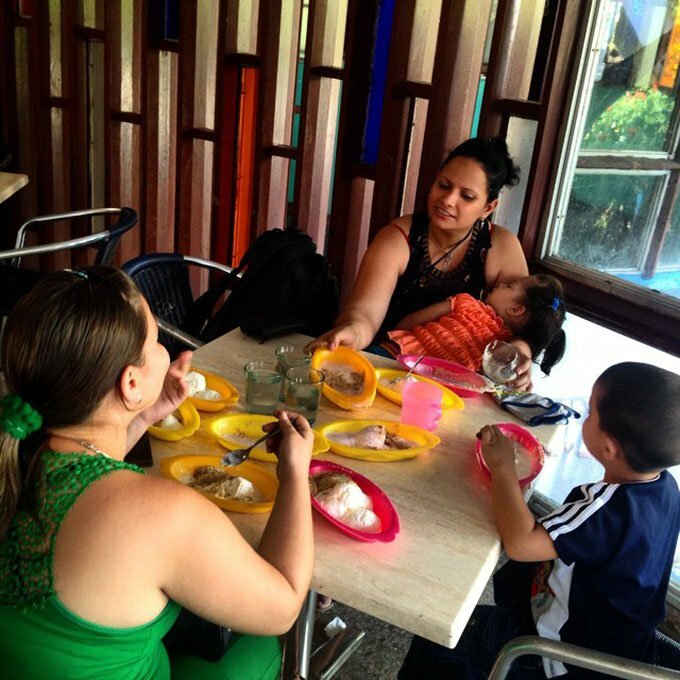 On feeding babies: Women are encouraged to breastfeed in Cuba. But compared to the U.S., breastfeeding feels like more of a necessity, rather than a choice. There’s practically no formula available, particularly at an affordable price. I feel for the moms who have a hard time breastfeeding. Also, its common for doctors here to tell moms to give an infant watered down root vegetable purées in addition to breast milk to make sure they gain weight, which surprised me. When babies are ready for solids, Cubans feed them malanga, a starchy tuber that looks and tastes like a cross between a potato and a yucca. It’s a bit of an acquired taste, but most Cubans love it. When Alma began eating food, we tried to feed her malanga, but she refused. It was the height of the summer and there where few other vegetables available for her to try besides pumpkin. Luckily, she loved that, but she had so much pumpkin that summer she literally turned orange from all the bete-carotene and we took her to the pediatrician before we figured out what it was! The rest of the day, Cuban cuisine is all about rice, black beans and pork or fish, as well as local crops like yucca or plantains. 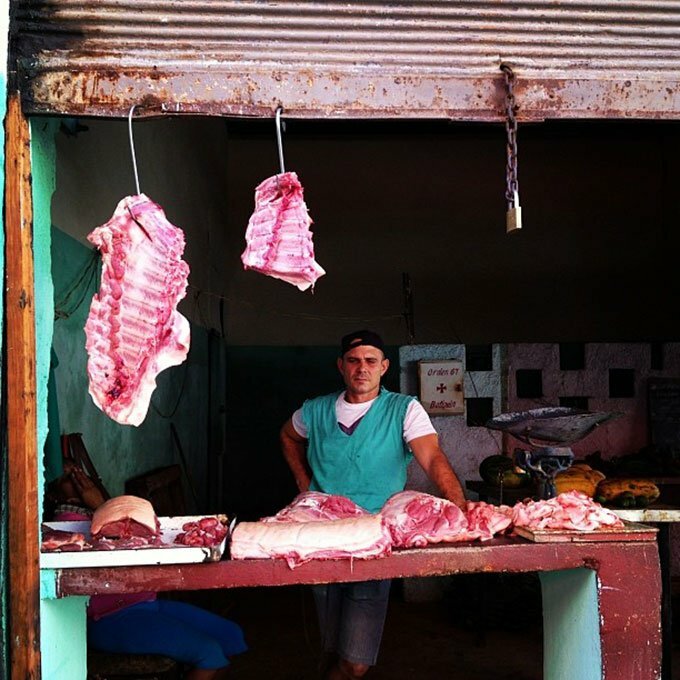 The government provides subsidized food to the population via ration cards, which Cubans use to shop at local bodegas. Seasonal eating is a trend in many countries, but here it’s a practical approach, because vegetables and fruits are not usually imported. So, we get the best mangoes during mango season, but once it is over, unless we freeze them, there are no more. In general, vegetables are not a major part of people’s diets, and I don’t often see parents urging kids to eat their veggies. On improvising in the kitchen: We often have to be resourceful and adjust our cooking plans around what we can get. At the moment, it’s been a few months since I’ve seen chicken breasts available at the market, for example. Last year on Thanksgiving, my father-in-law and I spent hours driving around trying to find potatoes, which are a black market item. People will normally walk up to you at the vegetable market and whisper, “I have potatoes.” But, that day there were none. We were like potato junkies trying to get our fix of mashed potatoes for Thanksgiving! On going out: During the past few years, because of shortages, spices weren’t widely available. 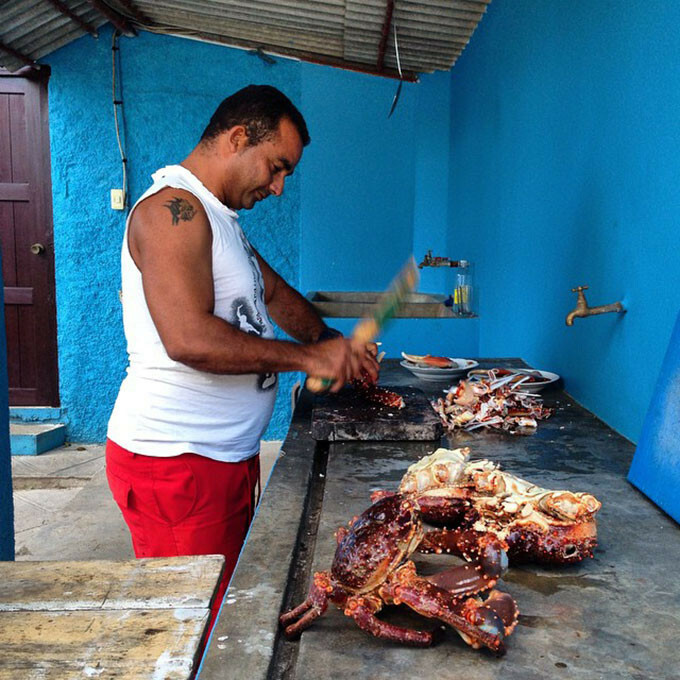 In many Cuban homes, food was seasoned simply, with just salt, onion, garlic or oranges. 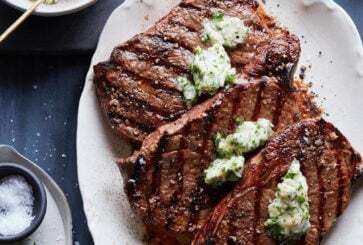 But, recently, more elaborate cooking has come back in paladares, which are family-owned restaurants serving traditional dishes. 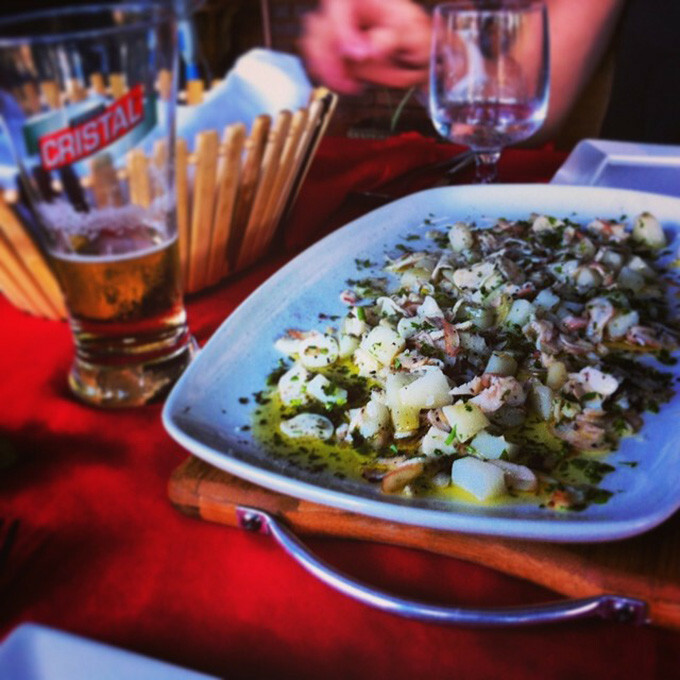 We love taking the kids out to eat fresh tuna and octopus, along with superb pork dishes. Patrick and I met 17 years ago at a well-known paladar called La Guarida, when we were both here for the summer in our 20s. Back then, there were very few private restaurants, and by law they could only seat 12 people. You were basically eating in someone’s living room. Today there are many family-run places that look and feel more like restaurants. We have our favorites that we always go back to. La Guarida now seats over 50 people and has a cool rooftop bar and cigar lounge that feels like Miami. 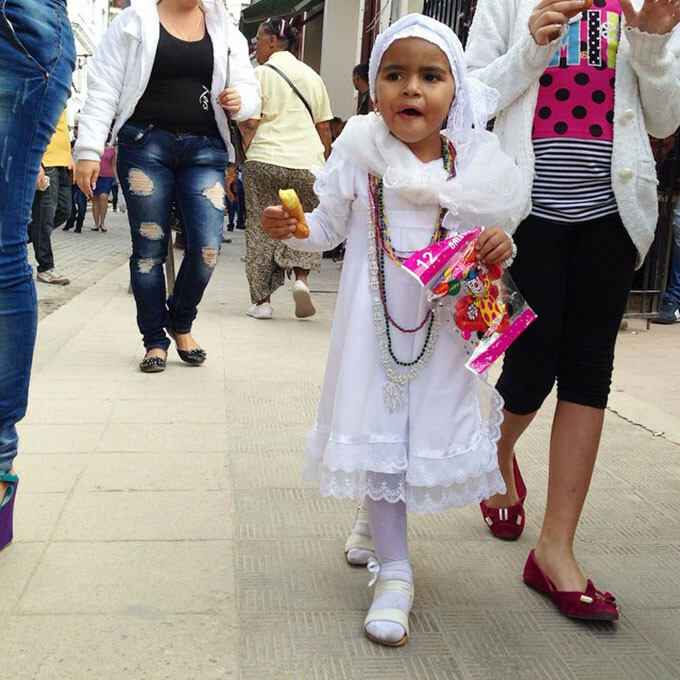 On the love of sugar: Cubans seem to regard sugar as its own food group! 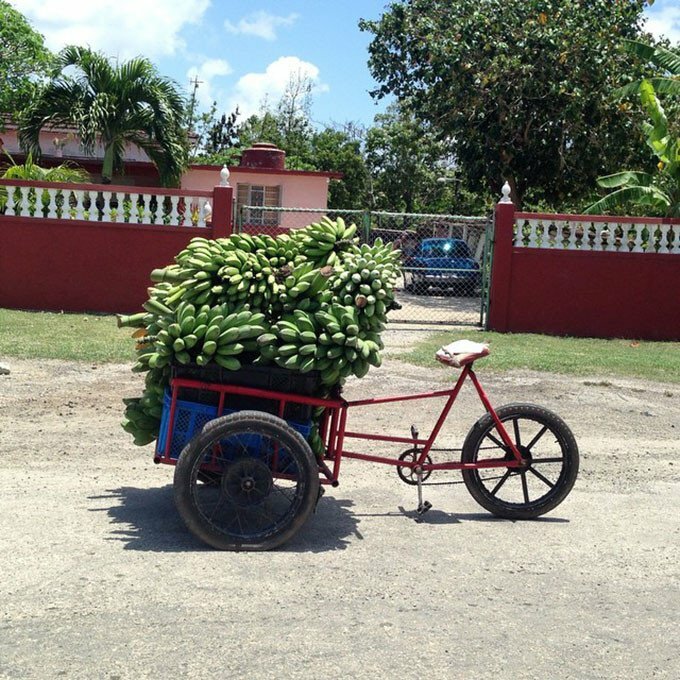 Sugarcane is grown here — Cuba was at one time the world’s largest sugar exporter — and people love sweet things. In fact, on Cuban TV, health experts often talk about sugar as a good source of nutrition and energy. It isn’t rare to see children as young as one eating sugary foods or drinking soda. On safety: This is a police state on an island. If you commit a crime, you are more than likely going to get caught! Also, there are few to no guns. As a result, it’s incredibly safe here. Everyone in our neighborhood knows our kids by names and we stop to chat on the street. Cuba still has an overall sense of tranquility, because it’s so disconnected from a lot of the world, which is hard to find anywhere else. It’s an amazing place for children to grow up. All kids, including ours, play outside with little supervision. On cars: The variety of vintage cars in Cuba is mesmerizing. 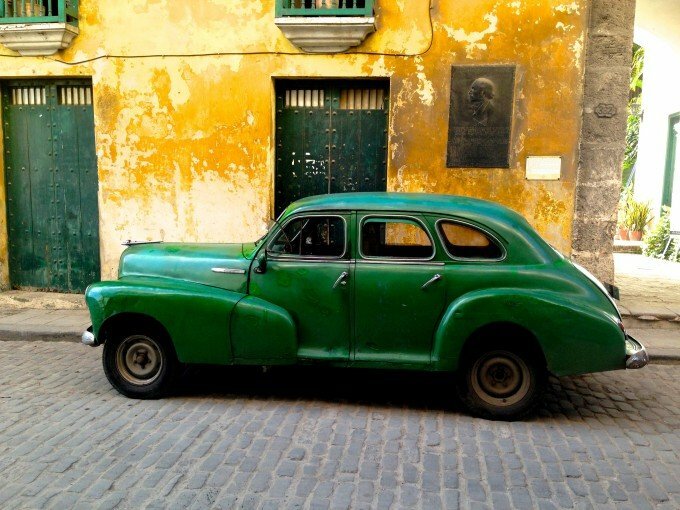 The first year we lived here, before getting our own car, I got around using almendrones, which are old cars from the 1950s that have been reconfigured with new engines and drive specific routes as taxis. Everyone and everything that can fit squeezes in, and for about 50 cents you ride along with other passengers, until you get close to your destination then you ask the driver to stop, usually yelling over loud reggaeton music (Spanish reggae). It’s a fun and cheap way to get around. On playtime: Recently, I’ve noticed that rollerblading is catching on among kids here. Cuban trends are often way behind the rest of the world, so it’s not surprising that an American fad from the 90s is just arriving! A significant difference between kid culture in the U.S. and here is that Cuba has one of the lowest Internet penetration rates in the world. It’s difficult, if not impossible, for the average Cuban to get online. That means that unlike kids in the U.S., many Cuban children have no idea what the Internet is and probably have never seen an iPad or iPhone. They find totally different ways to amuse themselves. Often, I see a group of kids sharing a makeshift car toy pulled by a string, a papier-mâché doll or a ball. Playtime is simple, but certainly no less fun. On baby gear: There’s no culture around baby stuff in Cuba, especially compared to the U.S. Moms usually use strollers or cribs handed down from relatives and fixed up over and over. The least expensive umbrella-type stroller at a Cuban government store costs about $80, which hugely expensive for the average Cuban. But Cubans are so resourceful and I’ve noticed moms carrying babies in locally handmade backpacks similar to the Ergo or Baby Bjorn. Above: The Tropicana dancers at Carnival, one of Cuba’s biggest holidays, held each summer along the Malecón. On holidays: Until recently, Christmas wasn’t an official holiday in Cuba and it was frowned upon by the government to celebrate it. There are usually few public decorations around the holidays, which I miss. 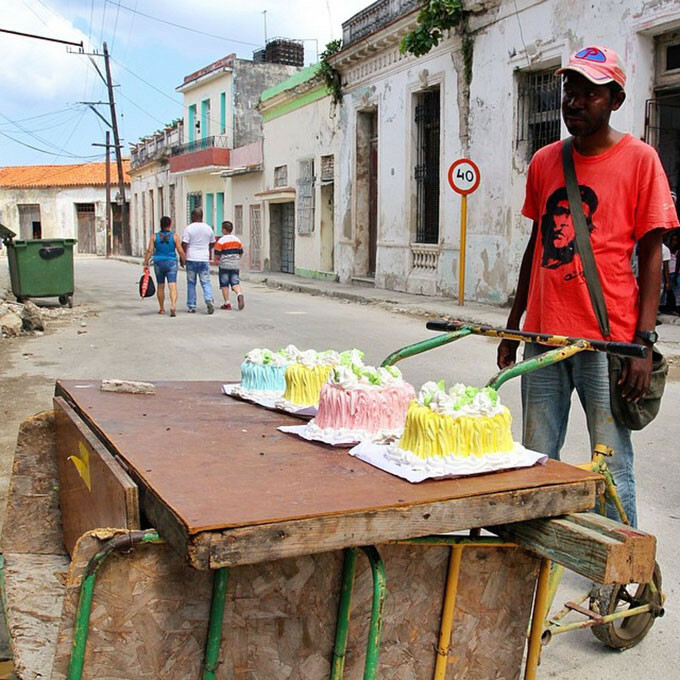 But, Cuba is hardly a nation without celebrations. It’s exactly the opposite. New Years involves feasts and rum. Everyone cleans their house on New Years day and throws the cleaning water onto the street to rid their homes of bad vibes. On Mother’s Day, strangers on the street will congratulate you the whole day, as if you won an Oscar. It’s funny and really sweet. Friends, including Patrick’s coworkers, will text me congratulations and send gifts. Telephone lines are so congested from all the Mother’s Day congratulations it is difficult to place a call on that day! On identifying as Cuban: Our daughter speaks fluent Spanish with a Cuban accent, and our son isn’t far behind. He already makes Cuban hand gestures, like, when he says, “Mama donde estabas?” — every time I leave the room — he puts his hands out to his sides palms up like he is doing the Macarena. I cherish this, because it shows that Cuba is part of their heritage; they’ll always be Cuban to some extent. Friends who have lived here and left look back on their time in Cuba with such joy, having forgotten any hardship, and I’m sure we will be the same. 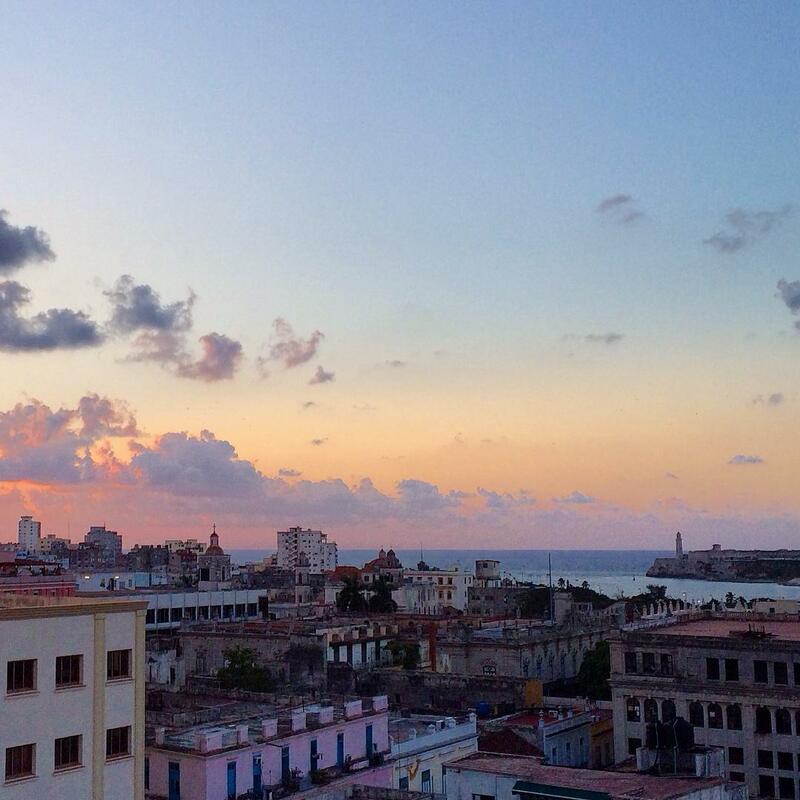 There is something truly magical and vibrant about Cuba. Thank you for sharing this insightful article! I’m part Cuban, and many points expressed in this article are DEAD-ON. My father is Cuban and came to this country in the 80’s, when he was 35. He never assimilated to American living. A lot mentioned here is exactly how my father lives today. He makes due with less, expects the government to subsidize living expenses (ha! ), isn’t used to questioning the status quo and his idea of a perfect day is fishing, calisthenics, and Santeria. 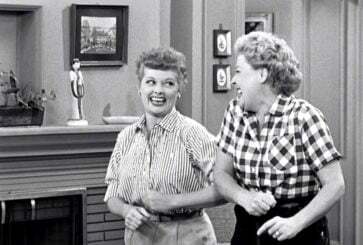 I used to think that his ideals were just about sheer laziness and passive living (how American of me!). I realize now that its culture, not laziness, that makes him who he is. This all sounds so rosy but really the struggles Cuban people go through is very trajic. Here in Canada my two week old grandchild’s mother became very ill and had to be hospitalized for two weeks while I took care of the child. What happens when a mother cannot breastfeed and there is no access to formula or milk? Washing disposable diapers if you can get them is unimaginable and there are no cloth diapers. I was in Cuba last December and I left feeling very sad for these wonderful people. I’ll be in Cuba in November. Got your name from a former co-worker of yours (Heather K.) during your attorney days in Seattle. Any chance of touching base with you in Havana (~Nov 10-11) before I head elsewhere? I’ve reached this site via a FB post, and I’m so happy! It is a wonderful place you’ve built for moms! I specially enjoyed reading about motherhood around the globe, since I’m Argentinian and I often feel “left out” in parenting forums that are too focused on a single country’s style of parenting. Since I’m talking about that, I’d be happy to tell you about raising kids in Argentina. I was very happy to find this piece as I am a Brit, living with my Cuban finance in Havana. We are planning to raise our child, due the end of this year, in Cuba but even though I know the island well, being a first-time-Mum so far from home will surely have its challenges. Great to read your comments! Hi I wanted to get more information if you can I am from the States( s.american descent) my husband is cuban born and raised his father lives there and I was hoping to spend the summer with my sons 4&5 over there. Any advice on things to take that I won’t be able to get I know medicine like tylenol etc. One of my sons has asthma do you think anyone will take his nebulizer machine when I get in through the airport there? 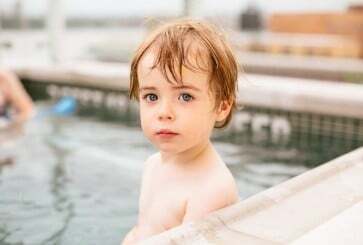 This is awesome, my husband and I are both Cubans, I have been raised here and he has only lived in the states 10 yrs now, We have a little boy age 5. We have talked about moving there for various reasons, one is for our son to enjoy what we feel would be a healthier childhood lifestyle. instead of so much wi’s and ipads and etc; but I must admit it makes me a bit scared and confused lol. But this is a great story, and well lets see if we go or stay. Good description, for a beginner resident in Havana. It is remarkable in its wording great intelligence and cultural and academic preparation. I wish you much success and good luck in your mission. I wish that the skies remain with you all the time. But do not forget to take care of you too, especially children. 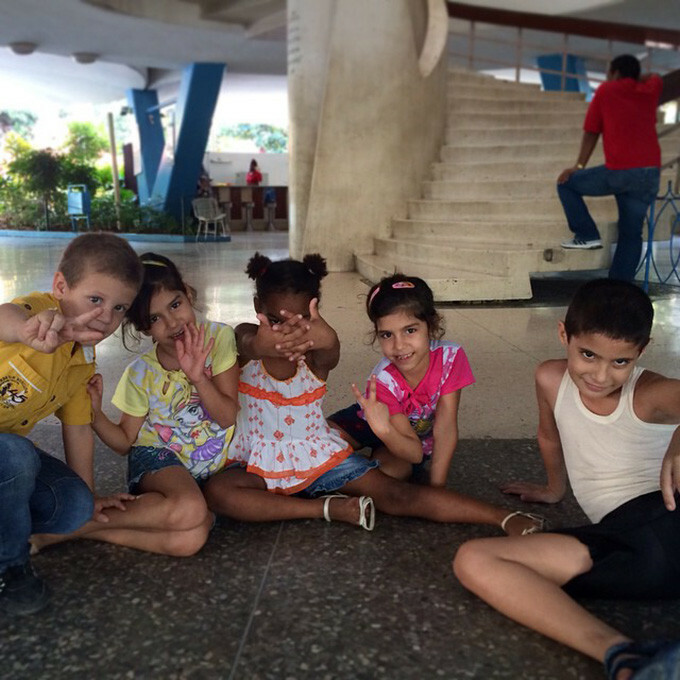 Children are generally very ones in Cuba, but everywhere as they require special care. Cuba sounds like a very fascinating place to live in. Given the stereotypical misconception of the country portrayed on TV and movies, it is very heartening to know that the streets are so safe and children can play freely without much supervision. Loved this post!! Cuba sounds like a fascinating place to be. These are my favorite posts! Keep them coming!! I get so excited when I see a post from this series pop up – This one was my favorite yet. Thank you for continuing! 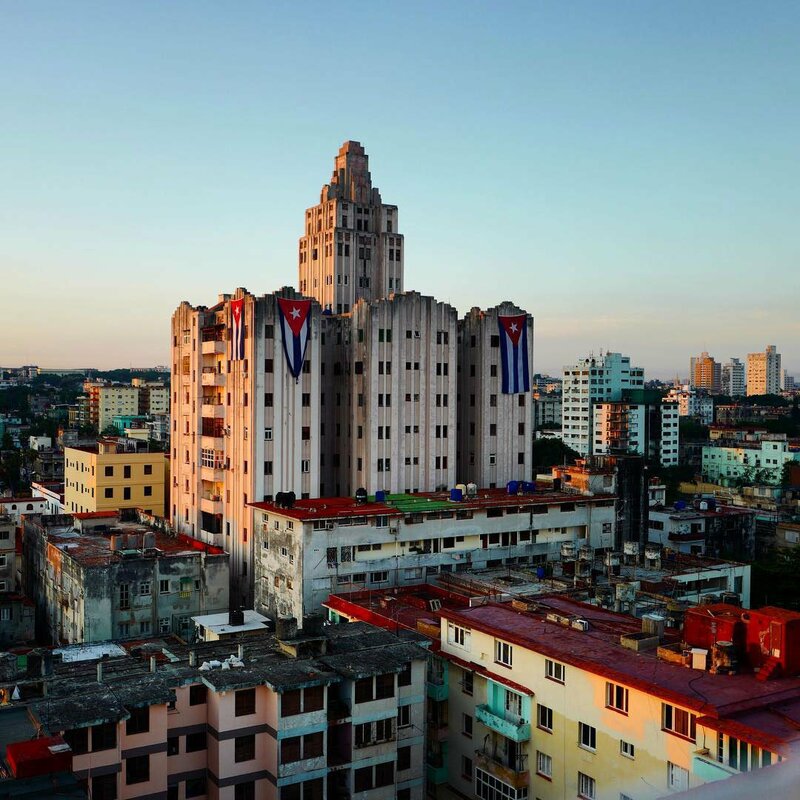 What a wonderful and interesting article on Cuba! Thanks for this wonderful series from an expat mama living in the Philippines! Interesting read. I’m from Miami and married to a Cuban American so I was already familiar with the culture, politics and history of Cuba but it was nice to get a glimpse of the every day life of its residents. 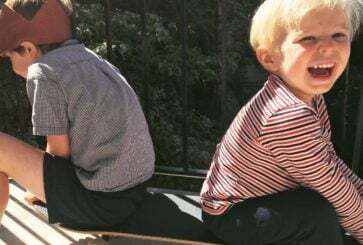 I do agree that this post, like the one from Spain last time( which I’d so been looking forward to reading since I’m an expat mom in Barcelona) seems to be mostly about living abroad and not about motherhood abroad specifically. Perhaps future series can include more of this. really like these series about expat life, and Cuba was a smart idea!! I actually would love to read articles from the point of view of working people (kids or no kids): most of your interviews are made with stay at home moms (or sometimes women with very baby-compatible jobs), and I think we would learn a lot of things about society by talking about working habits as well… Also, speaking to expat moms of working dads just reinforces the stereotype of women stopping everything and following their husbands, and never the other wat around, and this makes me sad! My parents fled Cuba in the 1970s, and we still have family there, whom I’ve visited a half-dozen times. 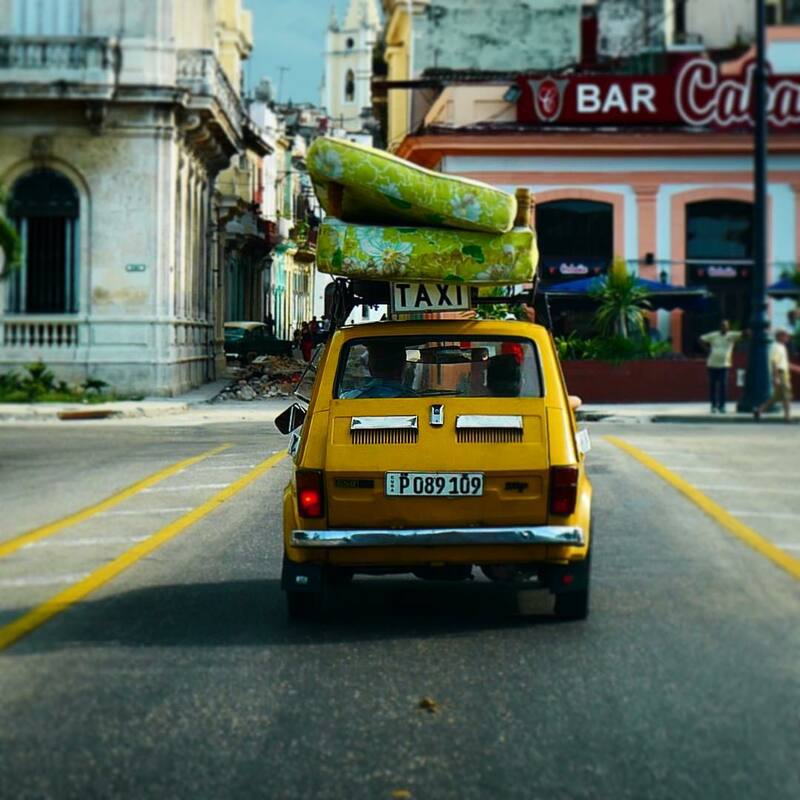 I agree that this account feels romantic in a way that ignores the actual hardships Cubans face–though it’s clear the author loves Cuba for its beauty, friendliness, and simplicity. 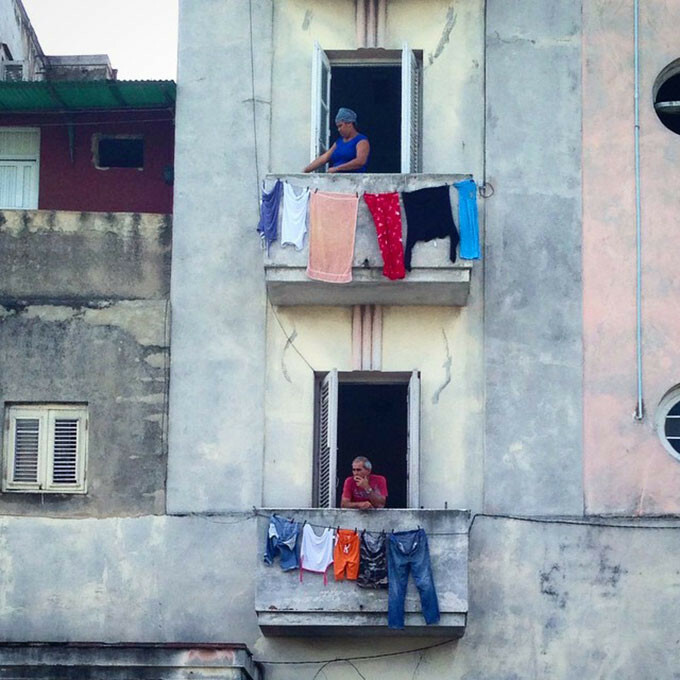 But life there is hard for Cubans who cannot ever leave or get a reprieve from the government’s power. We’ve lost two family members in the last 16 months to diseases that would have been treated fully and promptly in the US or Canada. The education is free, yes, but it’s heavily biased and supplies, electricity, and food are meager, at best. The people are wonderful, it’s true. But please don’t paint inaccurate images of a place that has been beaten down by decades of Communism and of lives that have been lost because of power-hungry leadership. 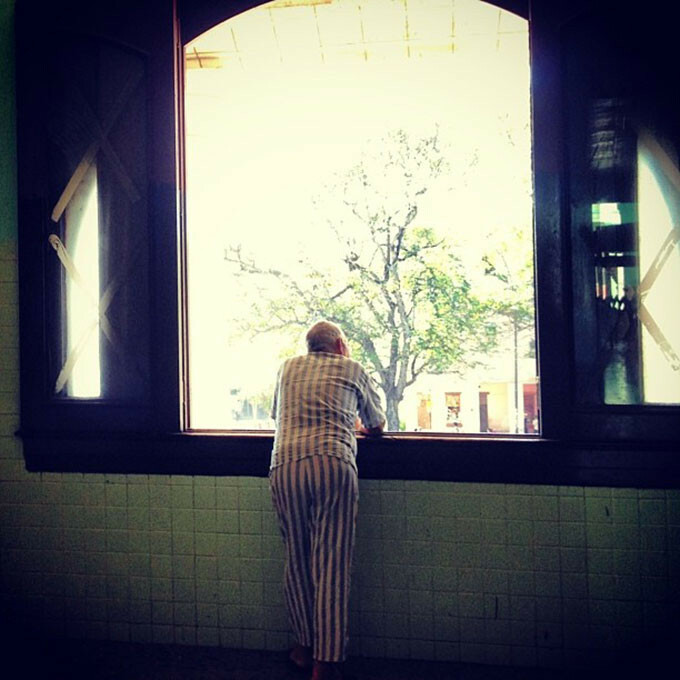 So amazing to read what it’s like to live in Cuba! I visited there on holiday 3 years ago (not American, so I can do these things) and it was one of the best experiences of my life. It’s such an amazing country – people are so friendly, and so resilient. 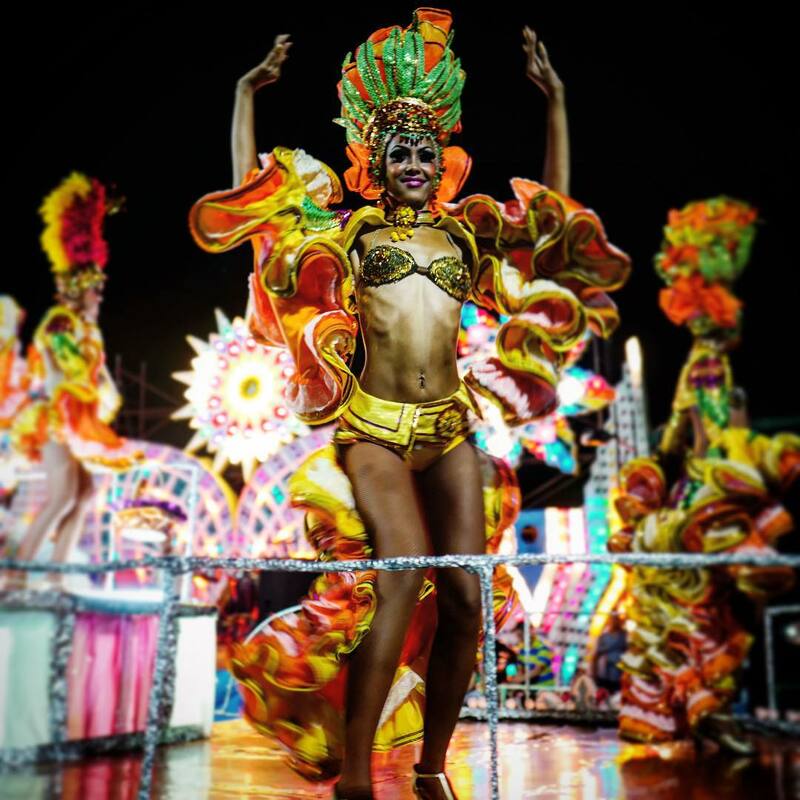 We flew from Canada, and flying over Miami and then Havana at night – you see a huge contrast. Miami was completely lit up, whereas Havana only had patchy lighting (and while there, the old city was without electricity for a week). Everyone looks out for each other e.g., like in Havana we were waiting to buy some churros, and a homeless man walked past the churro stand. Without a thought, the owner gave him some for free – such a simple but sweet gesture. 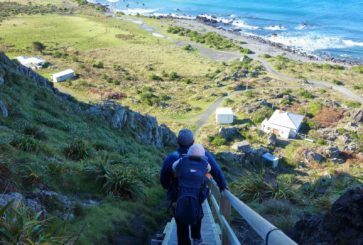 It was also interesting finding out how people get by, like there’s very little public transport, so people hitch hike (driving around was a dream – no traffic!). We picked up two brothers who worked at a cigar factory, and they were so grateful – they’d been waiting three hours for someone to go by. To thank us, they invited us to their brothers restaurant, gave us amazing coffee (the coffee bush was right next to where I was sat) and juice, and for the rest of our time in that town they looked after us, arranged outings – generally made sure we were treated well. I would love LOVE to go back. It’s one of my favourite places ever. My friend was born and raised in Cuba. She raised her only son there before moving to the US. She once told me that it was common to give your child a bottle of coffee. She said when he was little (he’s now 18), milk was hard to come by but there was an abundance of coffee and it was completely normal to give babies a bottle a coffee sweetened with sugar. I thought that was so interesting because here in the US, we think of coffee as an adult drink. There’s also that assumption/myth that coffee stunts your growth, but her son is over six feet tall! Katy, your friend’s son would have been 3 years old at the time that Cuba’s trade relationship with the former Soviet Union went to pieces (1990+), and the country lost some 75% of its foreign exchange earnings. Cubans had it very, very difficult. At the time Cuban children received special diet supplements and guarantees from the government, while the majority did without until new trade relationships were formed (and all of this while the country still had the U.S. trade embargo weighing on it). It’s a fascinating period of Cuban history, which shows Cuba’s amazing ability to survive in the face of hardship. 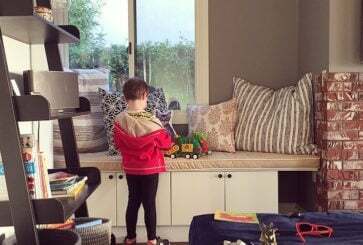 as ever… these parenting globally posts are so interesting, fascinating, and wonderful. thank you for this series! These posts are my absolute favorite blog posts ever. Please keep them coming! Thank you for this series. I love it! And I am not even a mother. This testimony was very nice, informative and really showed a positive point of view on what we really need in life. Thanks again. This is my favorite in the series. 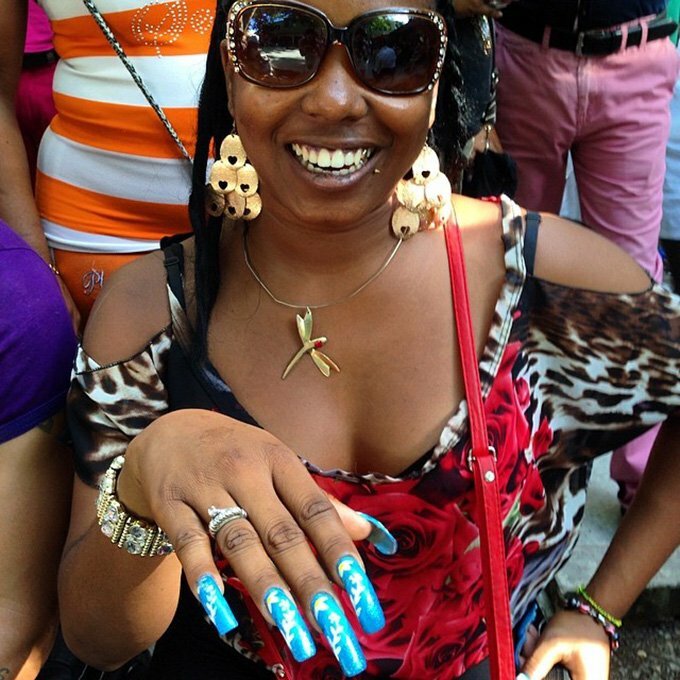 My husband and I went to Cuba in 2012 experienced so many emotions. 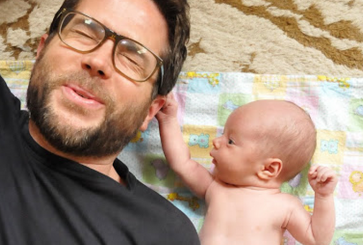 There are actually a few questions I had which are answered here – including the diapers! And yes, paladares are the best bet for food. Everywhere is overpriced and to be frank, just not very good. 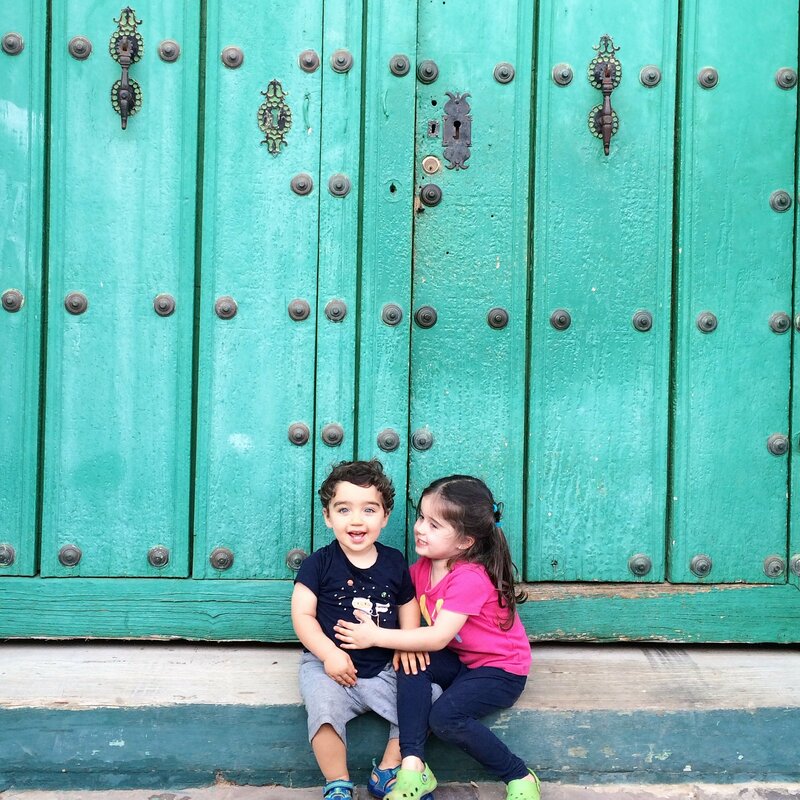 I admire raising two kids in Havana. 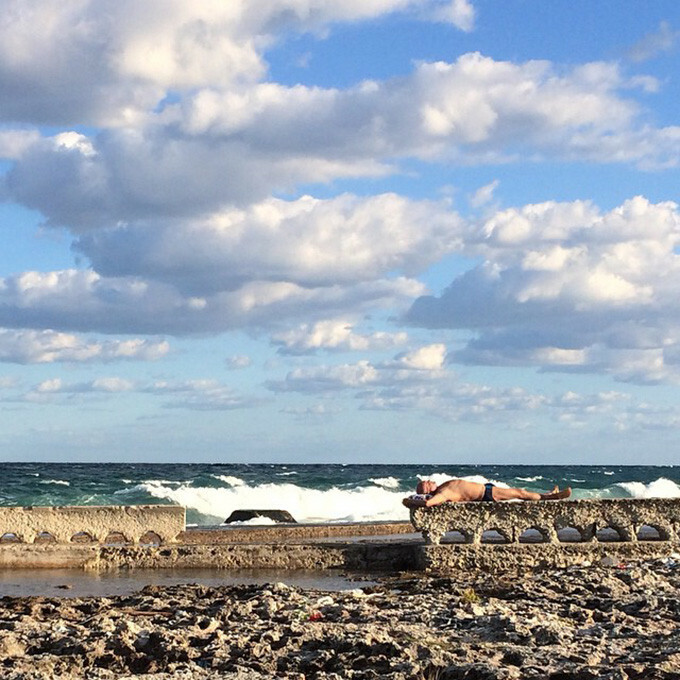 Cuba is a complex combination of extreme beauty and resilience. Thank you for sharing, Alexandra! Wow – absolutely fascinating. Thank you! Very nice and informative story. Can’t wait to go there sometime soon! Another great piece in this wonderful series! This one is particularly meaningful because my mother grew up in Havana. Even though I was raised here in the U.S., much of this rings true for me. And my mother and I both have a very hard time admitting when we don’t know something! It’s also so nice to see that people are raising happy children under such difficult circumstances. Thanks for this! Wow, this was a particularly interesting one. Thanks for sharing! Loved the pics too. The “Surprising Things About Parenting in ….. ” is a very fascinating series but this summer it seems like it is taking a very different spin. It is significantly less about parenting and far more about just living in a different country. Still very enjoyable and interesting (really, I did enjoy reading about life in Cuba) but not really about motherhood, parenthood or children. This particular entry had maybe 6 items that were directly related to motherhood and/or children. Compare this to the “20 Surprising Things about Parenting in Germany” post. The entries just don’t seem to fit the series title anymore. I’ve noticed this, too, but gratefully. Kids are great! Parenting is amazing! But I love this broader approach. Alexandra & Joanna, this one was especially interesting because Cuba is still such a mystery and life is happening so different than in the rest of the world there. I love this series. Fascinating read, with beautiful photographs. My husband is Canadian, and when I lived there, so many of my friends would travel to Cuba for holidays. It wasn’t a mysterious destination like it is (was) to those of us in the US. I’m looking forward to exploring this beautiful country as it becomes easier to travel there. Very interesting to read. Alexandra has the freedom to leave the country whenever she wants and I think that’s a game changer. Cubans have a hard time getting permits to do it. I guess that gives a romantic twist on living in Cuba. It’s sort of like being a tourist there. Being a Cuban in Cuba must be very hard. We went on holidays once and saw that people were simply in need of “things”. If you wanted to tip your chauffeur he wouldn’t want money because he wasn’t able to buy what they needed/wanted, so instead he would ask for specific goods that one would bring from, in my case, Argentina, or ask us tourists to buy ( a watch, a nice T shirt, etc.) for them at the duty free shop. Things that he was not allowed to have access to. Like I said, pretty serious stuff. Smartest, most informed comment! I grew up in Miami and went to elementary school with many of the kids whose parents had escaped Cuba via the Muriel boatlift. …. poor, uneducated and heartbroken. Serious stuff indeed. I was so happy to open Cup of Jo today and see a new motherhood series. I am engaged, getting married in a month, and these series have been eye-opening for me. I may not be planning to start a family just yet, but my fiance and I have been discussing the option of working abroad with his company for a few years. I’ve been so overwhelmed with the opportunities presented to us with no idea how to choose where we should go. This series has been an immensely helpful resource to truly understand what it would be like to immerse yourself in the culture of a new country, but also what it would be like if we decided to start a family there. I absolutely love this entire series and I believe this would make a fascinating book. Please, consider it. Love your blog – a wonderful start to my day here! Your blog is so interesting. Thanks for sharing, please don’t ever stop this series! Thank you for sharing. I was just in Cuba in April, and this is bringing back a flood of memories and feelings! 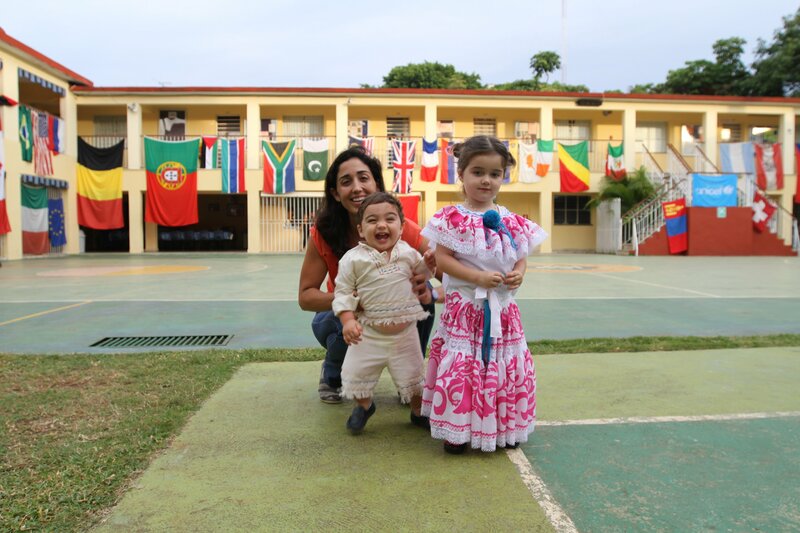 I’m just discovering your series about motherhood around the world and it’s fantastic! Cuba is somewhere I would really love to visit one day and this insiders view is great. The seaside life looks colourful and enticing! A very balanced and honest piece of writing. This was such a wonderful post, I loved reading about it! Thank you Alexandra for sharing your insights, and Joanna for your platform! I love these posts. I live in DRC, and it’s so nice to hear other women going through the same struggles (spending all day finding potatoes…yes) and putting a positive spin on it. Please keep ’em coming! such a timely piece in light of the recent changes to the political landscape between Cuba and the US. The photographs are beautiful as well. This has hands down been the most enlightening post of this entire series. I’m absolutely bowled over. Just incredible. Your writing brought me back to my childhood … Former Yugoslavia of the fifties and the sixties …. it was so how you write …. It seems to be common for all the former communist countries. With almost nothing and be satisfied with. However I am happy that my children had a different childhood. But they know about my childhood, too. And I learned them how to evaluate good and bad, to respect what they have. Respect other people and the nation. And how does one become a good human being. That’s what I got from communism. Communism is no more around me and I like it and my children too. i wonder if dental care is free as well with all that sugar consumption ? Thank you to Jessica who spoke more about the grievances of living in Cuba. As a Miamian, I hear stories all the time from Cuban immigrants about these unfortunate circumstances. I love speaking to Cuban, South and Central American friends and acquaintances that have settled in Miami about American politics. I feel they have a perspective so important to Americans, who have not experienced a lack of freedom, but slowly vote towards taking those freedoms away. So grateful for this one! Incredible to get such an intimate picture of life in a communist Latin American country – told in a language that’s familiar to me with reference points I would identify with. Thank you for this – and great interviewing/reporting, Lexi! This was wonderful. Insightful, well-written, and beautifully presented. The last several pieces in this series have really stepped it up! I love reading this series! This was especially interesting. This is by far my favorite series. I’ve always wanted to go to Cuba and this just fuels the fire. This is amazing! As a Cuban-American and a daughter of Cuban immigrants this was fascinating for me to read. 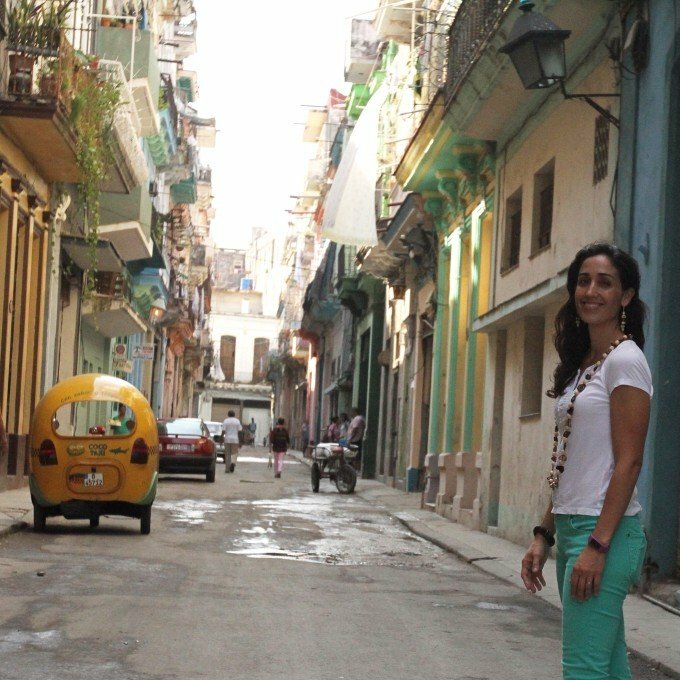 I still have a few relatives in Cuba, but I’ve always been so curious about culture and what it is like to live there. This was a fantastic read. Oh my gosh, this article made my heart melt. I’ve visited Cuba three times (I’m Canadian) and each time I have left overwhelmed with positive energy that is so characteristic of Cuban people. What a lovely family! Love this series. Fascinating read, especially about the lack of guns…if only the U.S. would follow suit! i second that! what a lovely idea!! Wow what an amazing read! I hope to get to visit there someday! Great piece, I would also like a little more on motherhood — such as how prevalent hospital births are, any pain relief, any postpartum care, child care. But lots of great insights. Thanks! this is perfect. I love reading about this culture, and the perspective as an american mother, especially considering the current state! it’s so exciting! I feel like most americans know nothing about cuba, this is such a great window. thanks for sharing! This one was FASCINATING. Cuba has been literally so foreign to Americans for all these decades, and yet so close! Thank you for sharing. I host a diaper drive every December – last year we gathered 2,500 diapers. We’ve historically donated to the DC Diaper Bank, a wonderful local nonprofit. But this post has me wondering if there is a practical way to get diapers to Cuba! With my first child I used cloth diapers and they were wonderful but when my daughter arrived on the scene I quickly had to prioritize my time caring for her and chasing after my son and soon switched to disposable. The thought of having to refill the cotton with questionable material. . . as if motherhood was already hard enough!!! Please advise if anyone knows of a way to get our Cuban mama-sisters some diapers! Felicity, what a wonderful thought! However, I was just in Cuba in April and was asking about shipping things back to Cuba when I returned home. My government guide (all guides are from the government since Americans still aren’t allowed to go “on holiday”) told us we could not ship anything unless we knew someone who was traveling back and forth from Cuba to the United States (Cuban-American citizen) and could carry it :-(. With all the changes, though, hopefully you’re able to do something this nice in the future! I just love this series so much and this might be my favorite so far. So interesting! i love this so much. So fascinating! Thanks for sharing. I never thought I’d be so grateful to be able to throw away a diaper and use a new one. my husband is cuban. we met while i was there on vacation several years ago and he has recently moved to the US. 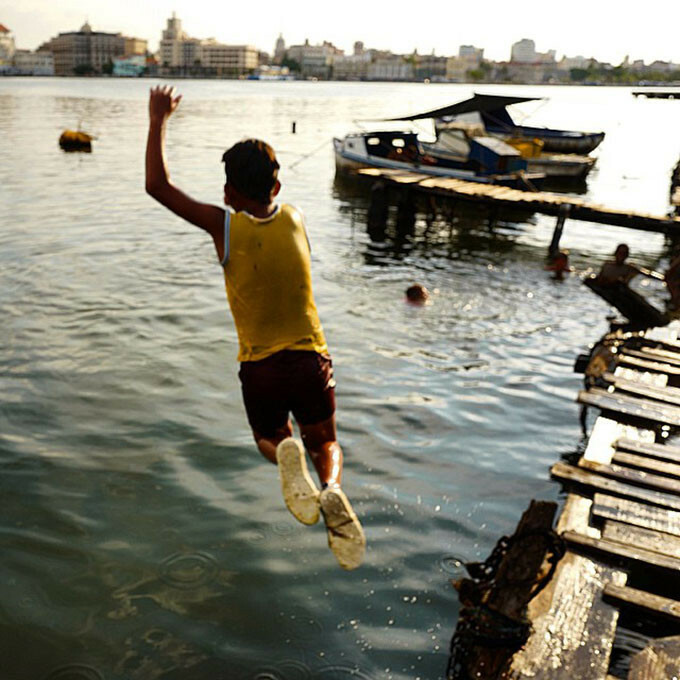 seeing these pictures reminds me of my love for cuba. we are planning on spending the holidays with his family in cuba this year – i am so looking forward to it. I am dying to go to Havana.. Its been a dream of mine for about 7 years now. I was so excited when they opened the flights up so Americans can go. I am hoping to go within the next year. That’s crazy that you can’t get diapers very easily there.. that would be rough. I have lived in a few latin american countries and tampons were hard to come by (TMI?) but I never saw an issue with diapers. One of my favourites so far. I will admit that I find Cuban culture and history fascinating. A great read, as all in this series is. Cuba linda! Infinite love for Cuba! Great piece, and great series! Although I also disagree about kids in Cuba not knowing what the internet is, it IS a great thing to see kids playing on the streets in Cuba. And in general in Latin America. I remember growing up in Europe and playing outside with other kids, unsupervised. I’m at the moment living in Canada and you don’t see that anymore. Nowadays, in North America, parents are charged with parental neglect for letting kids walk home alone from school. To me, that is madness! I know what you mean! I grew up in Finland and we used to play around as kids without parents supervising. Actually from when I started at school (7 years old), I would finish at around 12/1 pm and my parents at 4pm the earliest and I was always with friends or alone during those afternoon hours…I just read an article about this thing that in Canada you can’t let your kids out of your sight. This feels very shocking to me. Ps. Does anyone know how it is to get married in Cuba? For some reason I have this dream. Also my boyfriend is Brazilian and we live in Australia so cube would be a nice get together point for our families. 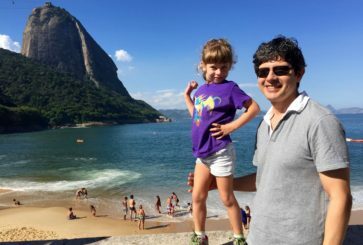 I pretty much love all the parenting around the world articles, but this one has to be my favorite by far. I was born in Cuba and came to the U.S. when I was 12, and I’ve been back several times, so I can completely identify with everything the author describes. 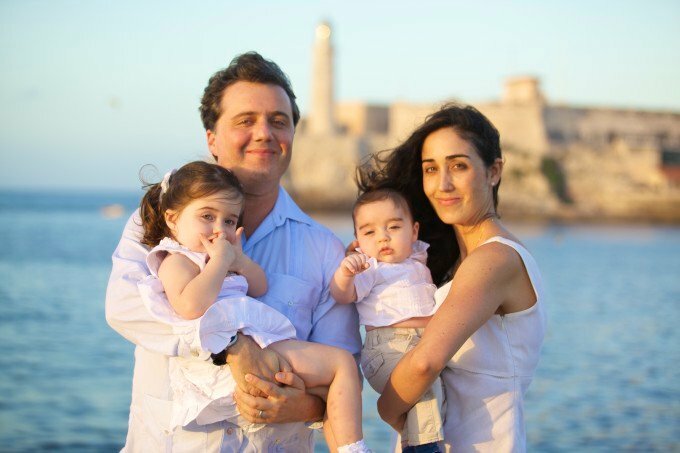 It’s actually funny to read someone describe parenting in Cuba from a foreigner’s perspective. I never really thought much of the sugar infatuation Cuban people have, but it’s oh so true. My favorite part was the part about trying to find potatoes for Thanksgiving. It sounds like something that would totally happen. There were a few parts of the article that felt a bit like generalizations, and I understand that this is just a glimpse into a culture, not a thorough study, but I think it’s a bit much to say that Cubans don’t eat breakfast. Milk is very hard to get a hold of in Cuba, so that makes it very difficult to have a traditional breakfast, but people “resuelven” (they find a way). And it also depends on what part of the island they are from. Havana is a lot different than most of the other provinces. Overall I think this article was pretty spot on. I really enjoyed it! 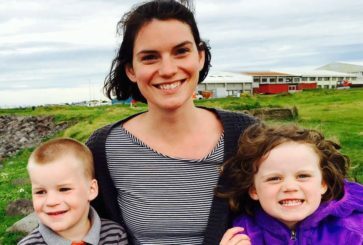 As a mother of two young children, my opportunities to travel abroad are non-existent for the moment. Thank you for series that provides such a fun opportunity to learn about other cultures when my feet must be firmly planted in the mid-west. Such a lovely piece! I was in Cuba for work earlier this year and enjoyed learning more about the culture. 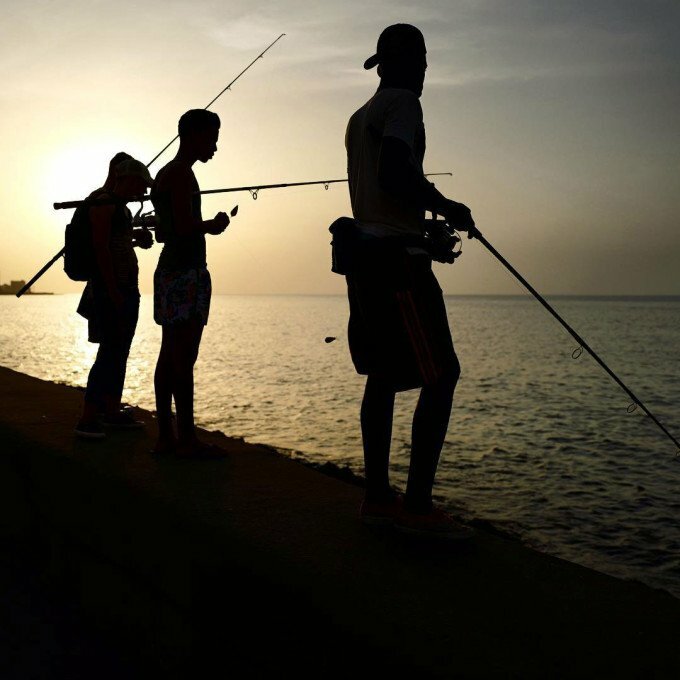 It is a beautiful place that is slowly changing — it will certainly be interesting to see how the thawing relations between Cuba and the US change the island. I’m American, but met my now-husband (who is French) in Vinales, Cuba, where we were both on vacation. On the last night of our respective vacations we met up again in Havana, and he took me on our first official “date” to La Guarida! Took my breath away to read that. I absolutely adore this series! Its truly amazing. As a Canadian, I’ve been two Cuba three times and Havana twice. The country and people are so beautiful, and I love hearing stories about their history, in particular the Cuban Revolution. I don’t think most American’s realize that before the revolution, Cuban’s were in general very poor, except for the small percentage of the population that were wealthy. People were starving. Literacy rates were low and people couldn’t access education. After the revolution, Castro built roads and schools, made education (even university education!) and health care free, and the well being and the lifespan of the population greatly improved. While I recognize that communism hasn’t been perfect for Cuba, the average Cuban citizen has a better quality of life than most other Latin American countries. I feel much more safe walking around a city in Cuba than the average American city. Cuban’s are very proud of their history, and I think they should be! Despite Cuban’s lack of medical supplies as mentioned in this article, they have a higher life expectancy (79 years!) compared to the more technologically advanced America (78 years). I think that’s pretty fascinating! I’m Canadian as well, and having visited Cuba several times growing up, I can relate to these comments. True, they may have limited supplies, however, the accessibility of their health care, and the knowledge of their health care personnel are recognized as among the best given their resources. My family and I have had to receive some medical care while there on one trip and we were impressed as to the level of care we received, with no doubts that we were in competent hands. They may lack what we have in terms of certain conveniences but there is a quality of life enjoyed there that loads of vulnerable people may not be able to access in a more wealthier countries. Love this series, please keep ’em coming! having stayed with my family and witnessed the struggles they go through on a daily basis to get the food, money, transportation, employment and general freedom they need to live at level even slightly past poverty, i would say that your assessment of cuba after communism is far too rosy. my young cousin, while his education was free, has no real job opportunities and there was often no food or electricity at his school. when my family sits on the porch to talk at night, they often whisper if they think what they are saying might be controversial for fear of spies or punishment. when we go visit them, we have to bring advil and tylenol and basic medical supplies because, while they can go to the doctor for free, they have no access to these things. not ever. in fact, several of my family members have even died because they didn’t have access to the treatments they needed to save them. many people don’t know that there are two kinds of currency in cuba that for, a very long time, have caused such terrible problems for the citizens of cuba that the average tourist couldn’t even begin to understand. i could go on and on about this beautiful place but really, the decay and simplicity of life that so many outsiders find charming actually indicates a deep and painful struggle for most cubans. i know it does for my wonderful family. so no. communism was not ideal for cuba. Thank you, Jessica, for telling the other side. It’s so important for us to keep in mind, especially as we, as outsiders, become more in contact with Cuba (I want very much to travel there, for instance) and fall more in love with the more obvious, rosier side of things. this was super interesting, although i don’t know how much it was about parenting, more about living in cuba generally. still very enjoyable! as an american i feel we don’t get to hear much about what living there is really like. a lot of things surprised me! Lovely article, and so close to Jamaica! I have never loved something online as much as I love Motherhood Around the World. 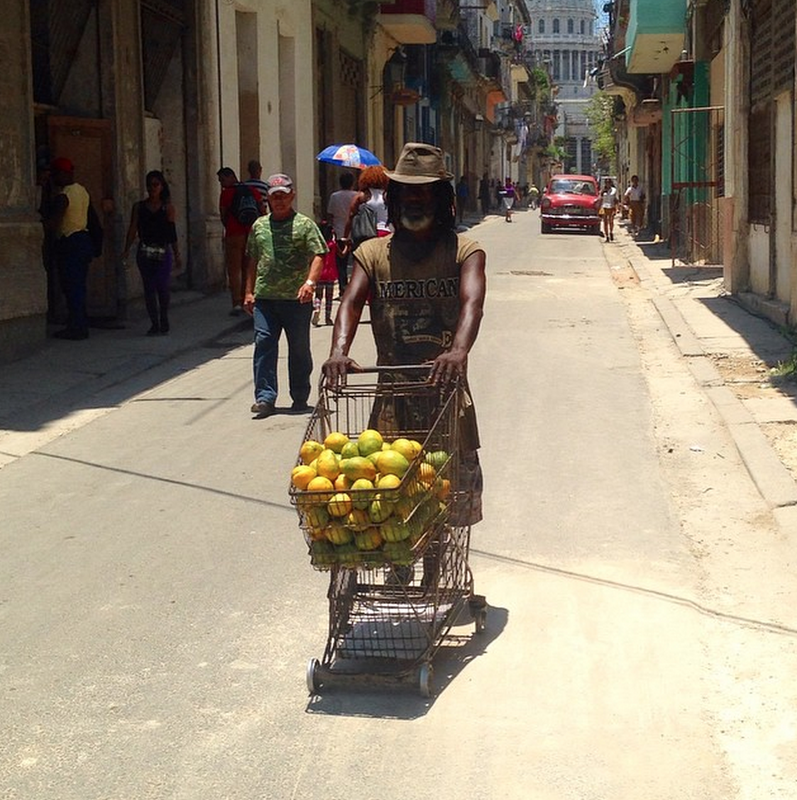 I want to visit Cuba and chat with strangers (and I never want to chat with strangers). After having lived in Cuba for the past six years, I can say that this was a pretty spot on overview of life/motherhood en mi Cuba linda. To say that “…many Cuban children have no idea what the Internet is and probably have never seen an iPad or iPhone.” is a stretch-the latest rage among Cuban children is getting their hands on a tablet (there are tons of children in my Cuban family, friend’s families, etc. )…also, there are many wifi hotspots all over Habana (the main one is at La Rampa, across from Coppelia’s). Slowly but surely Cuba is making tech. strides. Wow. I am Cuban, first generation American, and this was a fascinating read. Love this series. I also can’t decide how I feel about it. It’s like two polar opposite feelings about the life they have there. Beautiful to see a life untouched by the modern horrors that we have been facing here in the US, and also suffocating to be under the thumb of the government and what they think you need/deserve. Wow! 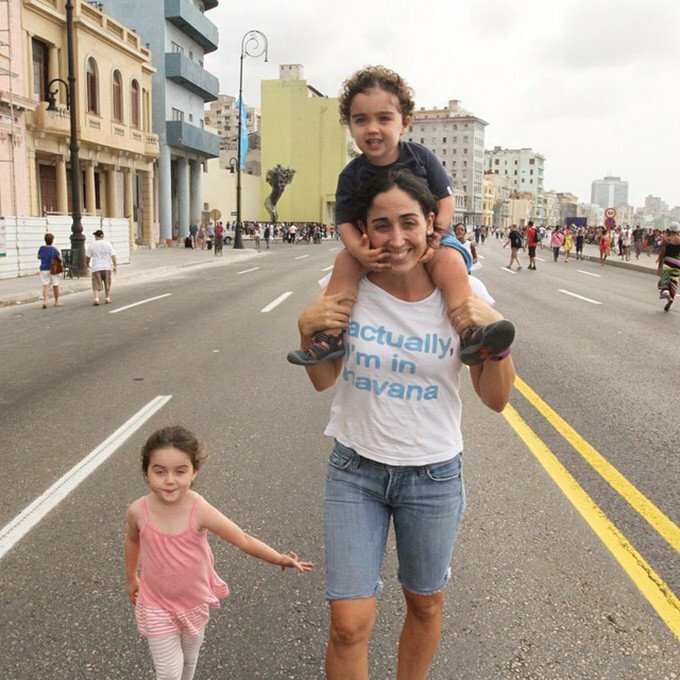 This piece on Cuban parenting was truly fascinating. Reading stories like this and seeing such vivid pictures give me a reality check when I start to stress about raising my first child in NYC – only one more month to go! Cuban breakfast sounds amazing. Espresso with sugar? Yes, please! So interesting and insightful! I love this series and it just gets better and better.